Zebrano is valued in production of parquet, decorative interior items, veneer for doors. This tree was often used in interior trim of German executive-class cars. 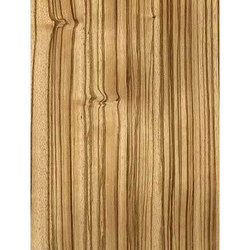 We have established ourselves as coveted organization, involved in offering Zebrano Veneer. Buyers preferred from Mumbai and near by areas. Note - Prices may vary as per client requirement and can also be negotiate over the call. Range : Cameroon, Gabon, Congo, Equatorial Guinea, lower tropical rain forests.